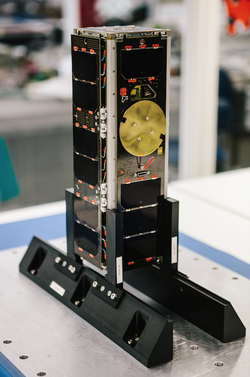 UKube-1 is the UK Space Agency ‘s pilot programme to design and launch a (3U) CubeSat – a miniaturized (30x10x10 cm) satellite that will enable the UK to demonstrate new technologies in space. UKube-1 was designed and built by Clyde Space Ltd in Glasgow and will be the first Scottish-built satellite to launch. Following successful launch and deployment, the UKube-1 Mission Operations Centre (UMOC) at STFC RAL Space established contact with the satellite and started in-orbit commissioning. The UKube-1 nanosatellite is a collaboration between the UK Space Agency, industry and academia. It is allowing the UK to fly educational packages, test new technologies and carry out new space research at a fraction of the cost of a regular satellite. It is envisaged as the pilot for a full national Cubesat programme. UKube-1 is an excellent example of how access to space can be made cheaper and opened out to a wide range of users through a nationwide, collaborative cubesat programme. We’re looking forward to the first science and outreach from this small but innovative mission. UKube-1’s payloads include the first GPS device aimed at measuring plasmaspheric space weather; a camera that will take images of the Earth and test the effect of radiation on space hardware; an experiment to demonstrate the feasibility of using cosmic radiation to improve the security of communications satellites and flight test lower cost electronic systems; and an educational project designed to engage and inspire school pupils. Developed by Airbus Defence and Space, the Janus payload is designed to demonstrate true random number generation in space, utilising the effects of space-based cosmic radiation. Random numbers are vital in encryption schemes which are used for secure communication systems, and true random numbers are ‘hard’ to generate. The experiment aims to demonstrate radiation induced random number generation in satellites for the first time. A second experiment within the payload aims to gather data on the radiation effects on SRAM based silicon chip architecture (Xilinx Virtex4 FPGA). The radiation used for our benefit in the random number generation experiment is a hazard to electronic devices which can range in effect from a momentary upset of operation to the complete destruction of a component. This experiment is designed to monitor such events and collect data on a specific silicon chip device for potential use in future space programs. The Open University’s Compact CMOS Camera Demonstrator (C3D) is a combined in-orbit radiation experiment and Earth Observation instrument developed with UK high-tech firm e2v and XCAM Ltd.
C3D will test e2v’s new CMOS image sensor technology and demonstrate Earth Observation from an ultra-miniaturised platform. C3D will help e2v and the OU better understand the use of CMOS sensor technology in space for the next generation of space telescopes and instruments and paves the way for the development of UK CubeSat miniaturised cameras. As well as providing a fantastic opportunity for innovative UK companies and UK academics to collaborate on a national space project, UKube-1 is also useful for training the next generation of space engineers and includes an education payload intended to support STEM initiatives. The payload consists of a tiny radio transmitter for science education and a materials science experiment from which school students can receive data which can be compared to results obtained from similar reference experiments in the classroom. The system, funded by volunteer members and friends of AMSAT-UK, is called FUNcube-2. The funding partners for UKube-1 are the UK Space Agency, the Science and Technology Facilities Council and the Technology Strategy Board. The spacecraft was developed through an existing Knowledge Transfer Partnership (KTP) with innovative Scottish space company Clyde Space and the University of Strathclyde. Engineering and programme management support is provided by the UK’s largest space company, Airbus Defence and Space. The platform development is supported through internal funding from ClydeSpace and STFC sponsorship of the KTP. Bright Ascension Ltd provided on-board and ground software elements to support spacecraft operations. As well as the platform and payload elements of the mission, UKube-1 is being generously supported by three Ground Stations. Led by the RAL Space Ground Segment, these crucial elements will provide the link to the orbiting spacecraft, as well as full planning of the operations. The supporting ground stations are provided by Dundee and Strathclyde Universities.